TH E M R EP O RT | 21 FEATURE P urchasing a home was once viewed as a rite of passage for young adults, similar to getting a driver's license or graduating college. As millennials—those ages 18 to 29—approach the age when home buying traditionally happens, few are actually entering the mortgage market, not for lack of interest or effort, however. This genera - tion faces a variety of challenges, which may impact the future of the housing market. Millennial Credit and Behavior Trends A ccording to a recent report from the Consumer Financial Protection Bureau, "Data Point: Credit Invisibles," young adults have a high incidence of being "credit invisible," meaning their credit histories render them un - scorable based on the traditional credit scoring methods. Traditional credit scores, like FICO credit scores, are calculated based on mort - gage, credit card, auto loan, and other installment loan payment histories. Given that millennials have not had the opportunity to develop a "traditional" credit history, in part due to the recent recession and tighten - ing of lending policies (Credit CARD Act of 2009), this demographic often does not qualify for financing with traditional credit scoring practices. Data released by the Federal Reserve Board of New York shows more than two thirds of the under-30 age group have credit scores under 681. Almost 40 percent of this age group have scores less than 621, while many others do not have credit scores at all. Since credit bureau scores weigh heavily in the credit deci - sioning process, millennials are potentially being barred from the mortgage market due to the wide- spread industry use of traditional credit scoring models, which render them "credit invisible," making it extremely challenging to secure a mortgage. Given the number of credit invisibles, it's clear lenders need to rely on more than just traditional credit data sources. Alternative credit data sources include insights from the wire - less, banking, peer-to-peer lending, checking and savings, and subprime markets, along with address change histories, to deliver a precise and unique view of a consumer's credit risk and worthiness. However, the mortgage industry has been the slowest to adopt alternative credit data because even with programs like HUD, which has a mission to "create quality affordable homes for all," mortgage lenders are reluctant to adopt new risk management tools due to heavy government oversight. According to ID Analytics' re - cent whitepaper, "Millennials: High Risk or Untapped Opportunity?" millennials were found to engage most with financial products and services that are the most available to them, especially ones that have not been affected by the Credit CARD Act of 2009. Dispelling the Myths Around Millennials and Credit I D Analytics' study reveals millennials are denied at a much higher rate than others, despite outperforming other demographics within the same credit score range. 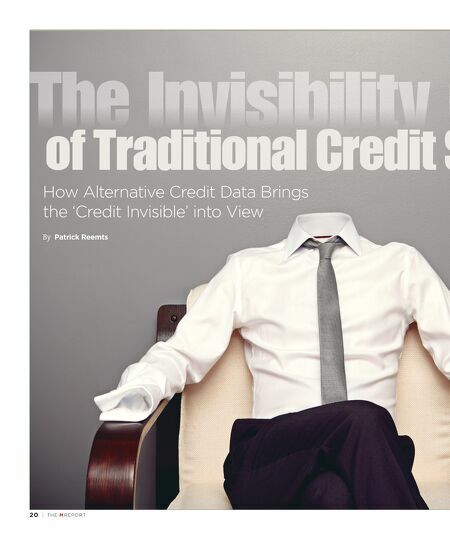 Invisibility Cloak Credit Scores Given the number of credit invisibles, it's clear lenders need to rely on more than just traditional credit data sources.